Big weekend finale for Folkmoot 2018! We’re building toward a big weekend finale for Folkmoot 2018! We’ve had a marvelous festival – stretching from Franklin to Hickory and many points in between. Thousands have attended Folkmoot performances and have been dazzled by our international folk dance troupes and have taken regional pride in our Angl0-Appalachian and Cherokee dance troupes. 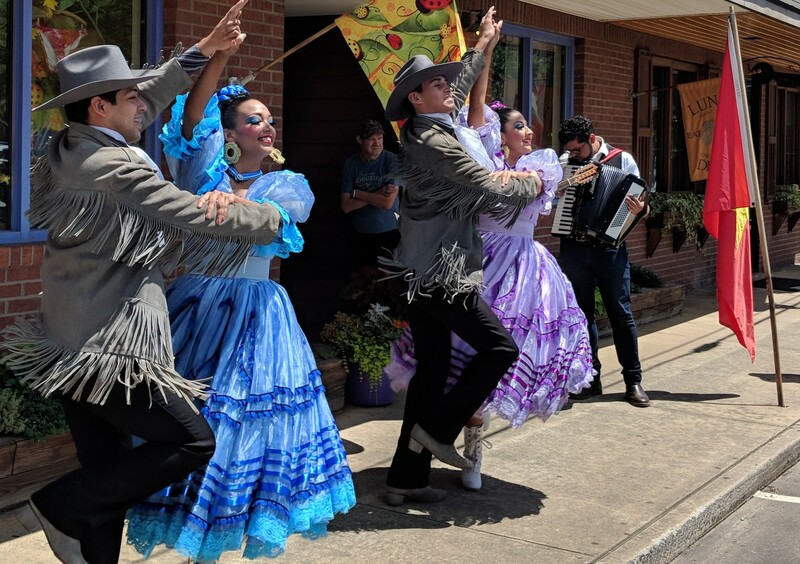 Folkmoot 2o18’s Finale Weekend launches from Asheville and lands for the always emotional and powerful closing ceremonies at Lake Junaluska’s Stuart Auditorium. Friday: Asheville, North Carolina. A 2 p.m. matinee in the Diana Wortham Theatre. A 7 p.m. performance in the Diana Wortham Theatre. Saturday: International Festival Day – Downtown Waynesville, North Carolina. 10 a.m. to 5 p.m. Another free and public event, a wonderful day of celebrating international friendships and cultural exchange! Saturday: Performance of all groups at Haywood Community College, 7 p.m.
Sunday: Candlelight Closing, Stuart Auditorium, Lake Junaluska, North Carolina. A rich, colorful & emotional last festival performance filled with tradition, joys and even a few tears! Share on the social media! We look forward to seeing and re-sharing all your Folkmoot experiences. Help us find what you post by using hashtags, #Folkmoot or #Folkmoot2018. Our Folkmoot Facebook Page has long had an active and growing community – now over 5,000 friends! Many of you visit and engage with it often – and we’re grateful for that. The Folkmoot Twitter presence has increased exponentially in recent months and we’ve added the Folkmoot face to other popular social channels: GooglePlus and Tumblr. The Folkmoot YouTube channel is evolving, getting up-to-speed and timely. We’re just continuing the grand Folkmoot party online and we invite you to join us on any or all of the social channels with which you engage most! Again, we invite you share your Folkmoot experience online – on the social channels you use most (or, maybe even, discover new ones). Please use the hashtags, #Folkmoot and #Folkmoot2018, when sharing. We will try our best to keep up and repost, share whatever you post online. Since the 2015 festival, Folkmoot has worked to diversify festival activities and shift from an entertainment “audience” model to an educational, “engagement” framework for the festival. What does this mean for our ticket buyers? We will continue to host festival favorites at concert halls and auditoriums across western North Carolina, but we will also offer more activities that allow for your participation. From community members playing in the international band, dance lessons on Main Street, Camp Folkmoot for kiddos, Cultural Conversations panel discussions, community dinners at local churches, educational partnerships with Rotary International, Western Carolina University faculty and Haywood County Schools music programs, Folkmoot is building new opportunities for our communities and international guests to experience and celebrate culture. When Waynesville surgeon, Dr. Clinton Border, returned home after seeing a dance team at an English folk festival, he thought such a festival would be perfect for Western North Carolina, which had its own rich history of preserving its traditional culture. It took from 1973, when Border made his trip, to 1984 before the first Folkmoot USA event took place. That year, symbolic as it was also the year that North Carolina celebrated its 400th birthday, welcomed performers from England, Germany, Holland, Ireland, Turkey, Mexico, Puerto Rico and India. In 2002, the Folkmoot Friendship Center leased the former Hazelwood Elementary School, thus giving it a home to expand its programming and activities. In 2014, the Haywood County school system donated the school to the organization. Now, this multi-faceted space has created an expanded opportunity for Folkmoot to move from a two week festival to a year-round cultural center, focusing on programs and events that celebrate diversity and differences, encourage cultural conversation and inclusion, and preserve and honor worldwide cultural heritages, especially using dance as a tool to achieve world peace. Since these humble yet visionary beginnings in 1984, more than 8,000 international performers from 200 countries have entertained and thrilled residents and guests of Western North Carolina. Folkmoot neighborhood party on Thursday! Thank you for a magnificent Folkmoot 2018!